Slovenia is a small country, yet it is distinctive because it offers a diversity of landscapes. The territory unites both the Alps and the Pannonia, and it is also bounded by the northernmost bay of the Mediterranean Sea. Once you anchor your yacht on the Slovenian coast, it may surprise you that you are already deep inside Central Europe. Slovenia's location is distinguished by its proximity to several European landmarks. To the north you will find Austrian Vienna, to the south Croatian Histria, and to the west lie Italian Trieste and Venice. Here you will have arrived at the geo­gra­phic and the cultural core of Central Europe - demonstrated by the creative synthesis of outside influences into Slovenian culture. With your Linssen safely docked in the fully-equipped marina, you should explore this bright-shining tourist city. It literally means Port of Flowers, although the rest of the Slovenian coast does not lag far behind. Some of you will first go to one of the numerous high-quality restaurants, whereas those who want to have fun will go straight to the casinos. There are plenty of ways for visitors to the Slovenian coast to have a good time. There are varied cultural, entertainment and sports events, famous spring and mud baths, ways to keep fit - and even the long tradition of thermal health treatments. Near is the old town of Piran, which draws visitors with its medieval centre. The town and its surroundings boast many historical monuments and a rich architectural tradition. If is mainly a place for entertainment, Piran draws you with its charming tranquillity and old Mediterranean elegance. An hour's drive inland from the coast is the Karst region, renowned worldwide for its underground treasures. Here you will find Postojna cave, an extensive underground cave system and one of the most important caves in Europe. The walking tour takes you through chamber after chamber, each one decorated with an unbelievable array of stalagmites and stalactites. A famous sculptor, Henry Moore, stated during his visit that Postojna cave was simply the greatest of mother nature's many exhibitions. A few kilometres from the entrance to the cave stands one of the most picturesque buildings in Slovenia, Predjama Castle. It hangs dramatically in the middle of a more than 100 metre cliff, almost arrogant in its simplicity. The castle's last owner was the robber baron Erazem. In the last episode of his career, his castle was being attacked. He had been taunting his besiegers for months, even throwing down fresh fruit. Finally, he was struck by a cannonball as he sat on the lavatory. The Karst region is well known for its excellent wines and cuisine. The unique, dark red teran is a rich and pleasantly acidic wine, viewed by some as indispensable medicine. Tasty meats are dried in the Karst wind (the burja), the most famous being pros­ciutto, which exudes the tempting aroma of juniper. North of Karst are the hills of Goriška Brda and the valleys of Vipavska Dolina, recognised as top wine-growing regions. After partaking of this culinary experience, just proceed north towards the Slovenian mountains. In the heart of the Slovenian Alps you will find the picturesque River valley, with the emerald river . The world's best kayakers and canoeists compete here and flyfishermen pursue the elusive trout. On the river, you can safely rise to the challenge of rafting, canyoning, fishing and other tempting water sports. is a good starting point for a trip to the imposing yet accessible Slovenian mountains. Ambitious hikers should attempt to climb Mount Triglav. For those who don't like to get too tired there are over a dozen renowned spas and they are very close to each other. Indeed, the distances within the country are really quite short - a critical advantage for Slovenia - and by car you can travel to its many treasures in just a day or two. Slovenia's landscapes will im­press you by their versatility. Here you will find several unique European landscape types in a relatively small space. It is said that Slovenia is Europe in miniature. In fact, its landscape is so rich that it offers visitors a unique quality of experience. It is not about summing up different landscapes, but rather spontaneously enjoying the magic of their natural and cultural synthesis. You are kindly invited to sail your Linssen into the blue Adriatic, with 1185 islands and reefs, and to visit us. You will not regret it. If you need any advice or help you can call Linssen's agent for the Adriatic: Cantal d.o.o., Ljubljana (www.cantal-marine.si | info@cantal-marine.si). Wooden fishing boats used off the coast for many years by Slovenian fishermen are still to be found in the marina at Portorož, where the international boat show is to be held. Among other things, this long maritime tradition has meant that after just nine years, the Internautica has become the most important nautical event on the Adriatic coast. Thanks in part to its tourist location, the Internautica international boat show has rapidly evolved into an event of real stature. Seaside visitors have been coming to Portorož from Italy, Austria and southern Germany for many years, and the first Internautica consequently had these visitors very much in mind. For logistical reasons, most of the boats on display in the first year of the fair were of Slovenian or Italian origin. However, once the Internautica in Portorož really got into its stride, interest also began to be expressed by boatyards from other parts of the world, especially Europe and the US. The boat show attracts many visitors from Eastern Europe and the republics that made up the former Yugoslavia, and the purchasing power of Slovenian boating enthusiasts is growing by the day. 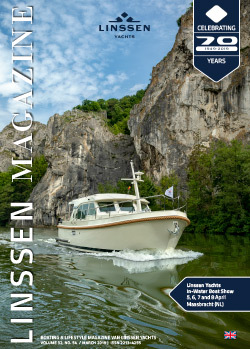 One of the first participants from outside the Mediterranean was Linssen Yachts, which was represented at the show this year for the third time. A major advantage of the Internautica boat show is that all the boats are in the water and can therefore be taken out for a sea trial. Additional landing stages are to be specially constructed next year, the tenth anniversary of the boat show, so that even more boats can be exhibited. The number of visitors is growing each year. Apart from Slovenians, larger numbers of boating enthusiasts are coming from abroad as well. During the fair there is hardly a hotel room to be found in Portorož. The influx includes visitors from Croatia, where water tourism is taking off, visitors from northeast Italy who realise that Portorož is much closer than Genoa and that the latest innovations are on display here too, and Austrians who, despite lacking any direct access to the sea, like to spend time on the water. This also applies to visitors from Bavaria, who can get to Portorož by car in just three and a half hours. The boat show also attracts growing numbers of visitors from the Czech Republic and Hungary. In order to make the fair more attractive and interesting, the Internautica organisers annually arrange all sorts of activities on the side for visitors to the fair. During the day, there is the prestigious ‘Tag Heuer’ Cup, when one can see the best sailors in action on the water, or one can enjoy a regatta of old-timers. For those interested a wide range of workshops is also organised in the field of boating and watersports. The nightlife takes place mainly in the hotels of Portorož, once in a while ending up in the small hours at the Casino. The Slovenian coast is located in the northernmost part of the Adriatic. Despite the short coastline and high population density the coast contains a large number of natural, cultural and touristic gems. In between two natural parks are the salt banks of Sečovlje, which provide a habitat for 135 threatened bird species. The most important features of the Slovenian coast are the old coastal towns of Piran, Izola and Koper, with their typical mediaeval architecture and wealth of tourist attractions. The main centre of Slovenian coastal tourism is the town of Portorož - sometimes referred to as the Slovenian Monte Carlo on account of its large casino. The large number of comfortable hotels also makes Portorož an increasingly attractive international conference city. The range of international regattas held in the Gulf of Piran means that sailors also feel at home here. In addition, Portorož has the largest and most exclusive marina on the Slovenian coast, with 650 mooring places, 350 places on land and a further 100 places in a covered building. The Portorož Marina offers high-grade technical support facilities and has now been awarded the ‘blue flag’ of the Foundation for Environmental Education of Europe on six occasions. In the central part of the coast is the little settlement of Izola, with its rich fishing tradition – which, if care is not taken, could die out due to overfishing. One of the finest marinas on the northern Adriatic coast is now located in the precise spot where for many centuries the fish used to be gutted and cleaned. A Grand Sturdy 410 has found a safe and warm home in this harbour, which has 650 mooring places and can also receive large yachts of up to 30 m. During the high season a number of festivities, including a fishing festival, are organised in the town, which is becoming an increasing tourist drawcard. Particularly attractive and interesting is the rural hinterland of the coast which, despite its proximity to the sea, has not been particularly developed for tourism. The hills are covered with vineyards, where the grapes ripen in the warm Mediterranean sun. Apart from internationally familiar grape varieties such as Chardonnay, Cabernet, Sauvignon and Merlot, the indigenous Refošk grape is also grown and, in recent years, more and more Malvazia. The superior wines from the Koper cellars marketed under the name ‘Capris’ have already won numerous international wine awards. A visit to these cellars is therefore highly recommended, if only to see easily the biggest wooden cask to be found in Slovenia. Olives are also widely grown in the coastal strip. The olive oil is of excellent quality, while in recent years a large number of olive varieties have been planted that had nearly died out. Culinary specialties for which the Slovenian coast is known are olive oil, wine and fish. Local dishes can be enjoyed in the many restaurants, ranging from the simplest to the most prestigious. Although many of these dishes resemble those from other areas around the Mediterranean, real connoisseurs can taste and smell the difference – particularly with the aid of a glass of Slovenian wine! Slovenia is also known for its highly distinctive Teran red wine (grown in the Karst region), made from the same grape variety as that used for the Refošk wine on the coast. The composition of the soil in the Karst region is, however, entirely different, and the result is also a totally different wine. Teran is an intense deep red in colour, with a lot of body and high iron content, for which reason this wine is prescribed – in moderation! – by doctors for patients suffering from anaemia. But before having a glass of Teran it is advisable to eat some of the delicious prosciutto ham, a local culinary speciality. This is dried in the Bora wind, a powerful, dry and cold northeasterly that blows from Karst towards the coast, especially in the winter months. Only the most experienced sailors will welcome this wind; amateur sailors will be more inclined to tie up in the safe environment of the marinas, or to visit one of the tourist attractions with which the country is so richly endowed.